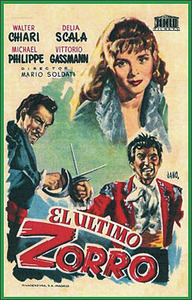 (1952) Vittorio Gassman, Delia Scala, Walter Chiari. First Time on Video! This rare Zorro film was made in Italy. Gassman plays Zorro’s grandson, who is timid and fearful. A series of exciting events soon brings out the hero in him. Aka Sign of Zorro. 16mm.